Cunard is to transform Queen Mary 2‘s Winter Garden into an elegant, airy and versatile new venue called the Carinthia Lounge. Named after Cunard’s much loved Carinthia ships, the new Carinthia Lounge will be installed during Queen Mary 2‘s multimillion pound refit from 27 May to 21 June 2016. Designed to be one of the most stylish spaces on the Cunard flagship, the Carinthia Lounge will transition seamlessly throughout the day, from a serene lounge serving light breakfast and lunch dishes, to an elegant evening venue. The Carinthia Lounge will also feature a dedicated patisserie and an afternoon tea service, with the option of a special Veuve Cliquot Champagne Afternoon Tea experience. In the new lounge guests will be able to sit and relax, catch up with friends or enjoy a good book. 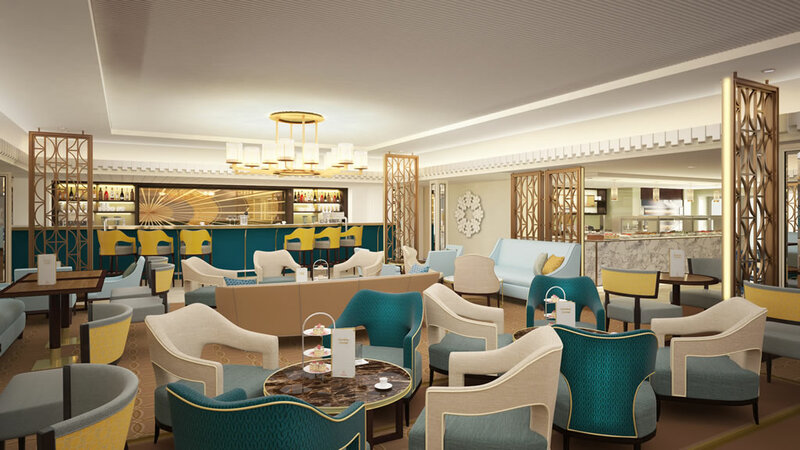 The Carinthia Lounge will feature a fresh colour palette of powder blue, cream and gold, and versatile seating layouts including dining chairs and tables near the new patisserie and chic curved lounge seating under decorative lighting. The spacious venue will also feature a wine wall, vertical metal Art Deco-inspired screens, and a dark walnut timber dance floor. Previously announced work to be undertaken during the dry-dock refit includes the introduction of single cabins and a makeover of suite cabins and restaurants.